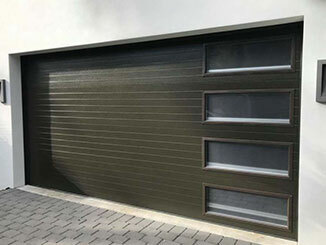 Modern garage doors can be made out of all sorts of materials, and some may be a great for your needs, while others could prove to be terrible choices. You need to learn a little about the benefits and disadvantages of each material in order to be able to make the right decision. This is one of the most common choices that many homeowners go with. Wooden garage door panels have a certain sense of wholesome beauty to them, and the curb appeal they offer can boost the visual and monetary value of practically any home. It's also a natural insulator, which means it can help make your garage more energy efficient without being enhanced via added sheets. However, wood requires a lot of maintenance, as it can rot or warp over time, and will need to be repainted regularly in order to prevent this. This type of material boasts enhanced durability, which is an excellent security addition that can bolster many households. The garage door is often the main focus point of many thieves and burglars, so getting one that's very strong and damage resistant presents an obvious benefit. This material has two distinct disadvantages, however. The first one is weight. Because steel garage door panels are heavier, they require a more powerful opener. If your current motor unit isn't capable of producing the necessary amount of horsepower, you may need to get a new one, or to go with a different door material. The second potential disadvantage is corrosion. Because steel can rust, it may not be a perfect fit for moist climate areas. The third most popular choice is an aluminum garage door. This material boasts a few advantages. It weighs very little, which means you won't need a powerful opener to move it. It also has very few maintenance requirements, as it does not corrode or rot, and can be perfectly suitable for different climates. However, aluminum can dent rather easily, so if you live in a storm-prone area, this type of material may not be the right one for you. There's no need for you to play the guessing game. Our experts at Garage Door Repair Leander are always happy to answer any question you may have, and we'll gladly consult you on the different door options available today and which material is going to be better suited for your needs.